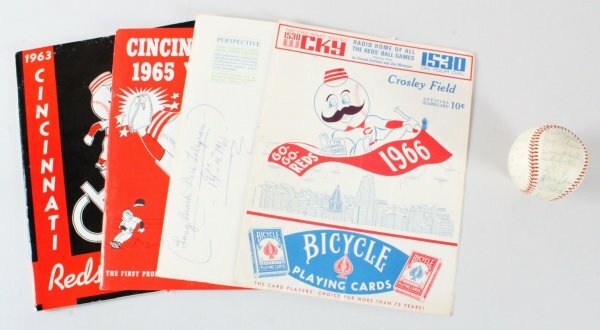 1966 Cincinnati Reds ONL Spading (Giles) team signed baseball Tom Helms (Roy) Tony Perez,, Pete Rose, Vada Pinson, Chico Ruiz, Milt Pappas, Mel Harder, Don Heffner & Whitey Wietelmann, Art Shamsky, Johnny Edwards, Jack Baldschun, Sammy Ellis, Ray Shore,Dave Bristol , Don Nottebart, Hank Fischer, Don Pavletich, Gordy Coleman, Jim Maloney, Deron Johnson, Jimmie Coker and five more. . Signature signed blue ballpoint and grade 6-7. JSA Auction Letter. Pete Rose Photo, 1963 Cincinnati Red yearbook, and 65 and one 1966 official scorecard VG Condition.